UTSIRA: Hundreds of thousands of Norwegians made the best of the country’s last long public holiday weekend until Christmas, and were able to enjoy lots of sunshine and unusually warm temperatures before heading back to work. On this windswept island in the North Sea, cars and people literally burst off the ferry from the mainland on Friday, looking forward to several days in what ranks as Norway’s smallest and highly scenic municipality. The annual pinse (Whitsund) weekend was extended for many this year: It began with 17th of May celebrations on Thursday, with many workers managing to take Friday off as well and thus have a five-day weekend. 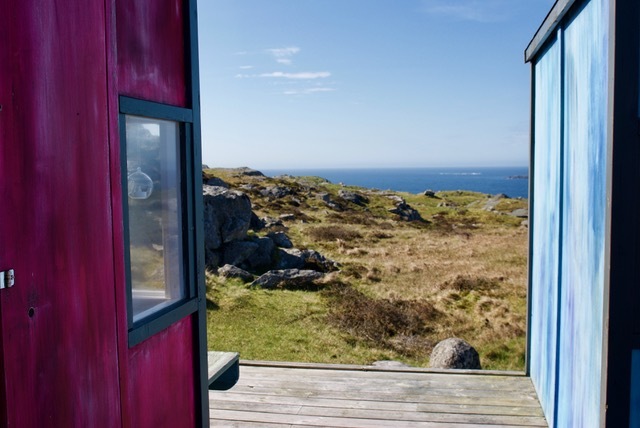 Those lucky enough to have holiday homes on Utsira, or otherwise book overnight accommodation, could enjoy areas of total solitude, or a festival called Siradagane that featured music, stand-up comedy, an outdoor market and children’s theater. Others would be able to retreat to any number of peaceful spots in the island, which is only six square kilometers in size but has lots of open space and undeveloped coastline. 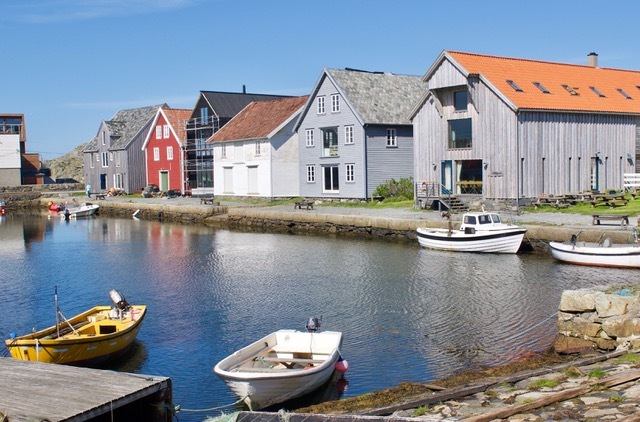 Utsira is Norway’s smallest kommune in terms of population, with just over 200 permanent residents who farm, fish, work as merchants or for the public sector, or commute to other jobs on the mainland. The ferry to and from nearby Haugesund arrives at this harbour on the northern side of the island, called Nordevågen, and makes four round-trips a day, which take around an hour and 10 minutes each way. Once on the island it’s entirely possible to walk everywhere, with the local church and landmark lighthouse among popular destinations. The lighthouse, Utsira fyr, was first lit in 1844 and ranks as Norway’s highest, perched at an elevation of 68 meters over sea level. 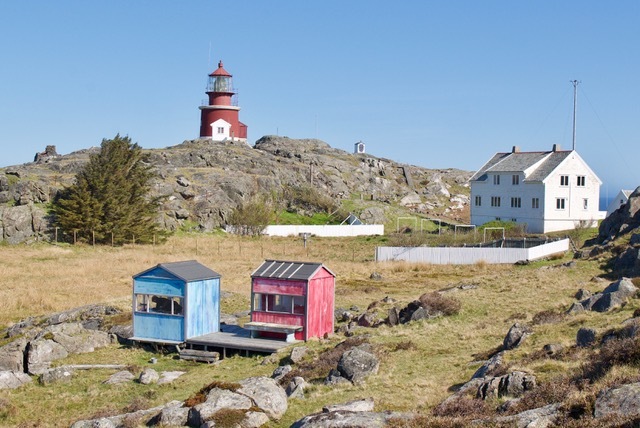 The two small hytter in the foreground were erected by an artist and the red one can be rented for simple overnight stays, also rooms in the old homes attached to the lighthouse. All offer sweeping views of the coastline and out to sea. It’s the coastline that beckons those keen on walking in lots of fresh air over open terrain on trails that run along ancient settlements from the Iron Age. 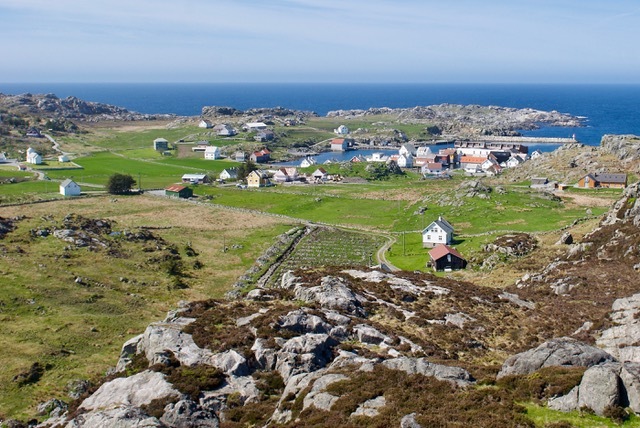 People have lived on Utsira since around 8000BC, and the island has hosted communities of hardy souls since 400-600AD. Marked trails lead hikers over rocks and fields, with plenty of sheltered areas for picnics or just sitting and enjoying the solitude. From this spot, along the trail called Vikingløypå, the next stop if heading out to sea would be the Shetland Islands in Scotland. It’s common to meet grazing goats along the way, but they’re friendly, watchful and curious. 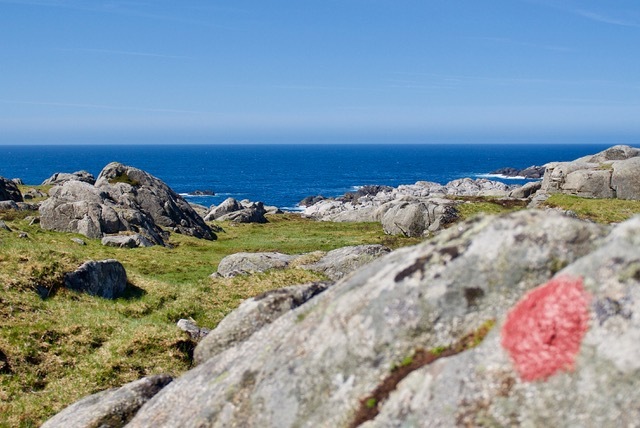 The area has also been the subject of various excavations by archaeologists from the University of Stavanger, with plaques set up along the trail at sites of several homes and farms dating from before the Viking era. Utsira is also known for its street art, even though it doesn’t have many streets. 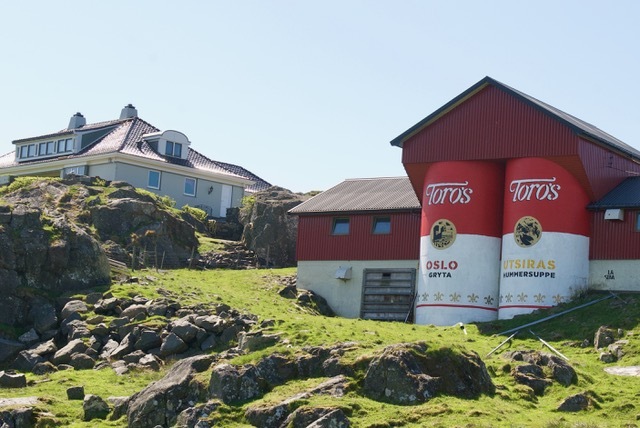 These silos have been painted in the spirit of Andy Warhol’s famous Campbell’s Soup cans, using the Norwegian soup brand Toro instead and an artist’s take on an Utsira lobster soup and an imaginary Oslo stew. “Oslo gryta” is also the term used to describe the traffic and crowds in Norway’s capital, in sharp contrast to life on Utsira. Note the large home at left: There were many signs of affluence on Utsira, in the form of well-kept properties and the occasional Porsche, BMW and Range Rover, even though their owners can’t drive very far on the island. 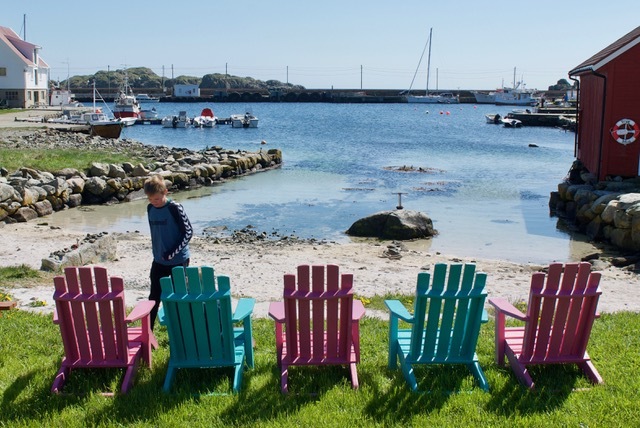 These colourful outdoor chairs were set up at a public beach at the island’s southern harbour, called Sørevågen, waiting for sun-worshippers. Not many people ventured into the water. From this lookout point on one of Utsira’s peaks, it’s possible to see around the entire island, which is almost perfectly round. This humble hytte was once used by los, the port pilots who competed to spot ships and row frantically out to be the first to board them, and thus secure the job of escorting them into harbour. That helped inspire the tradition of rowing competitions that are still a big part of 17th of May traditions in nearby Haugesund. 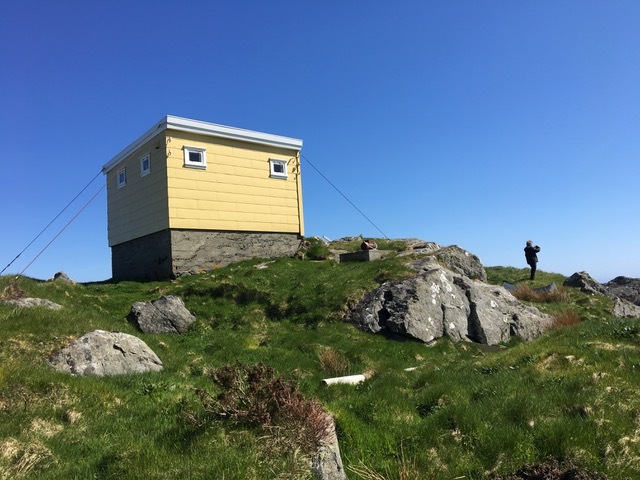 Utsira is now on the Norwegian government’s historic preservation list, for being representative of the West Coast region, its maritime heritage and residents’ close contact with the sea and other coastal settlements. 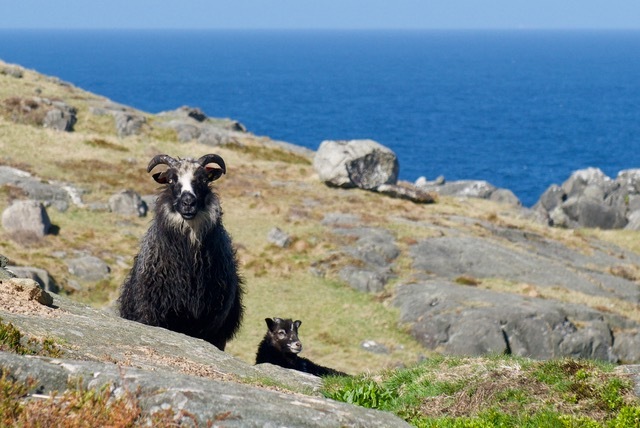 The island is also popular with birdwatchers, much like its northern equivalent of Vardø in Norway’s Arctic. 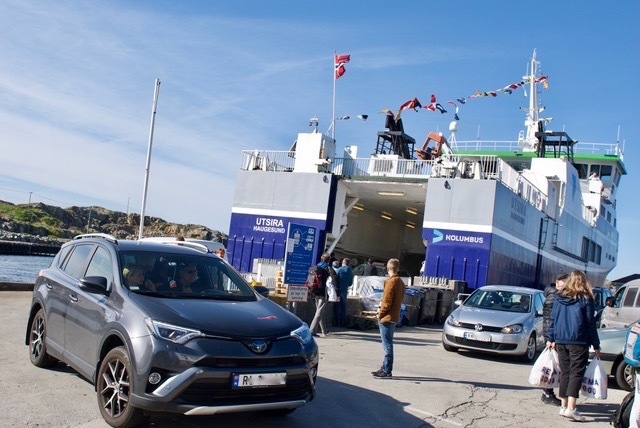 Those spending the long holiday weekend on Utsira, which is also known for its hummer (lobsters) and other shellfish, could simply hop on the ferry Monday, while others sat in traffic when heading home.